I had the weirdest vision this morning. As I meditated while stretched out in bed, I saw a vision of a large gorilla, walking upright, followed by a smaller one. The surroundings were green and lush. I had asked for some clarity about a program that I have been guided to create and this mini movie showed up. And let me tell you, it felt like a movie. The colors were vibrant and the picture was as clear as if I were sitting in a big screen movie theater. Needless to say, I was intrigued. I often have weird visions. I love this about my spirit. I am a detective at heart, so I get to fill this part of my soul by doing the research. I have several guidebooks that I often reference for meanings of things. Plus, I tend to do Google searches on the "dream symbolism" or "spiritual symbolism" when a bizarre vision reveals itself to me. This gorilla vision was definitely bizarre, so I jumped out of bed and grabbed Ted Andrews' Animal-Speak Pocket Guide. There was one line in the gorilla description that hit me: "Focus on the care of others for your greatest success." BOOM! I immediately knew that I was being reminded to think of this program that I'm creating as my way of being of service. I'm sharing my gifts to help care for others. And by focusing on sharing my gifts as my greatest act of service, this is where I'll feel the most successful. We tend to think of caring for others as doing everything for them. But true caring comes when we live from our hearts and share our gifts. Here's the problem: Unless you are willing to look within and discover your gifts, you don't get to be of service this way. In the past when I thought I was being of service, a lot of the time my acts came with attachments. I did things to help because I thought I had to. I wanted to be seen as good. Being good meant that I would receive love in return. I never thought of myself as seeking love. But when I began to check in with myself, I discovered my acts of service did indeed have attachments. If you are serving because you are looking for others' approval, you are acting from your head and will never truly feel the beauty in serving with your gifts. Unconditional love is the path out of your head to sever attachments. As you go within and honor your truth, your gifts are revealed. You feel so connected and on fire about life! Your life feels full and on purpose. And in this purpose, you serve without attachments. THIS is where you discover true joy. Have you ever heard someone say, "I did blah, blah, blah, and THIS is how I'm repaid"? That's an act of service with attachments. It's our attachment to the outcome that shuts down our joy. 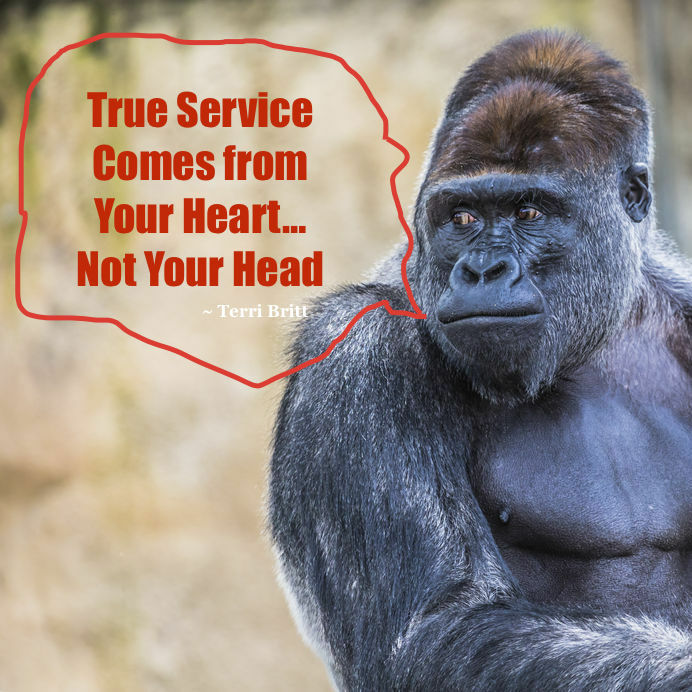 If you're in business and focus on what you can "get" rather than how you might be of service, you're probably going to struggle because you're in your head rather than your heart. And when you're in your head, there is no joy. Serving from your heart and sharing your gifts puts God first. But as you focus on service with the need to get something in return, you attach yourself to the outcome and disconnect from God. Serving from your heart shifts you from survival mode into love mode. It is here where miracles show up. Love mode is where every need is met, your relationships heal, and your life soars with joy. After I had the gorilla vision show up this morning, my hubby and I took our dogs for a walk. Of course, I had to share my experience with Charlie. Doing so reminded me how hard it is for most to keep the attitude of being in service. It's all about the attitude. Are you going to come from your head or from your heart? Are you going to serve out of survival or love? We own JumpinGoat Coffee Roasters. This is Charlie's baby. We offer gourmet coffees, candies and other various products. The normal attitude in this kind of business would be to think about sales and the bottom line. After all, we have to survive, right? But it is this attitude that keeps a business owner in competition and struggle mode. A different way to look at this coffee business, and every other business, is to see the service we are providing to others. With our company, think of all the people who get up in the morning and sit quietly drinking that cup of coffee. They are taking a moment to themselves. This is love. We are providing that service. Our JumpinGoat retail store is in Helen, Georgia. This is a tourist town in which people from all over come to get away. Families, couples, and all kinds of groups, whether Harley crowds or bachelorette parties, visit us to make memories. Our store is just one place. Every business and winery here in the mountains of Georgia is in service, helping people have fun and enjoy themselves. When I think about how we got into the coffee business, I am reminded that some years ago, Charlie had gotten in touch with his heart and discovered how he wanted to create his life. He had a vision of living in the mountains and having a coffee company. He loves food. He loves the mountains. And he loves serving people. His whole business started with love and getting in touch with who he is and his gifts. My gorilla vision this morning reminded me that I had done this as well and to continue to serve by sharing my gifts. What about you? Are you sharing yours? If you truly want to be of service, make a commitment to love yourself unconditionally. Get in touch with your heart. What makes you tick? Discover what makes you unique. Instead of being attached to seeking love and joy outside of yourself, find the love within and share your gifts! 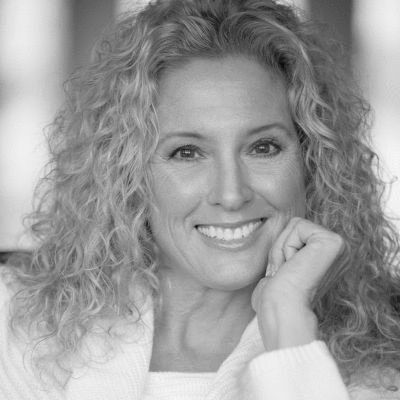 Terri Britt is a spiritual coach, inspirational speaker, former Miss USA, and the award-winning author of The Enlightened Mom. Are you ready to open up and receive? It's time to raise your Worthiness Quotient! If you are ready to step into unconditional love and share your gifts, get the FREE Worthiness Quotient Breakthrough Bundle now!